The yearling daughter of Ghostzapper drew sparse attention the day she was paraded into the Keeneland sales ring . One horseman’s opinion in 2010 was: “She was hardly a beauty. Nothing really wrong with her, but she was on the small side, and a bit chunky. 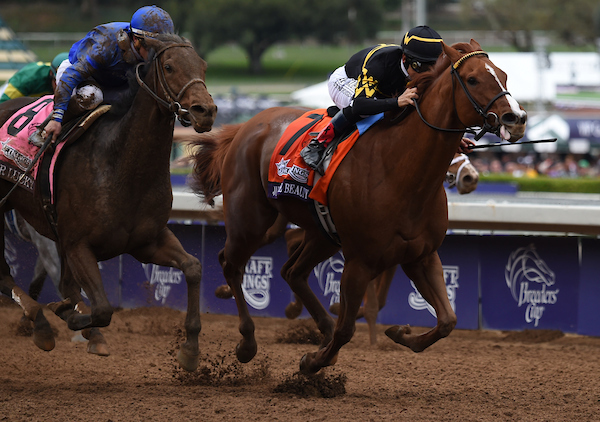 Quite ordinary.” Also, her sire had yet to prove himself and buyers were sitting on the fence as the bidding stalled at $20,000 for the chestnut filly bred by Frank Stronach’s Adena Springs of Aurora, ON. 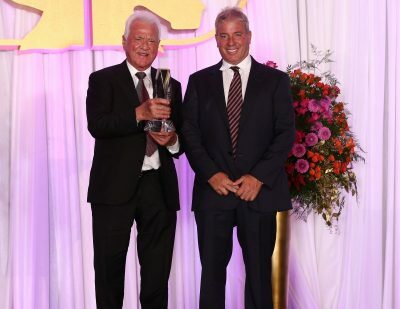 Judy the Beauty’s breeder Frank Stronach presents the mare’s owner/trainer Wesley Ward with her Hall of Fame trophy. Years later when reminded of his assessment, he said “In hindsight, a huge mistake”. Yes, Wesley Ward, the owner and trainer, might agree. Under his tutelage she would go on to earn $1.8 million and named an Eclipse Award as champion female sprinter of 2014, a year in which she won the Breeders’ Cup Filly and Mare Sprint (GR1) at Santa Anita. At age four she established herself as one of the top female sprinters in North America, winning the Thoroughbred Club of America Stakes (GR2). Her stakes victories also included the Rancho Bernardo (GR3), Madison (GR1) and the Las Flores (GR3). It was a bounce back season after finishing second in all three of her starts a year earlier. 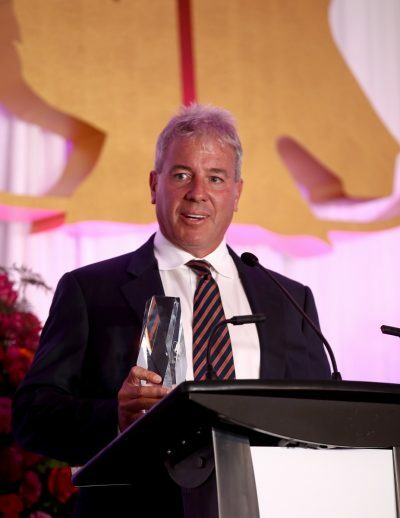 Owner/Trainer Wesley Ward speaks about Judy the Beauty as he accepts her Hall of Fame trophy. Ward, a former Eclipse Award winning apprentice jockey, realized early in her career that she was loaded with potential. In 2011 she won her maiden debut at Keeneland, shipped to Woodbine, where she won the Shady Well Stakes, and then traveled to France and Chantillly where she captured the 1,000 meter Prix Caravelle on the turf. Her final race as a juvenile was a second place finish in the Spinaway Stakes (GR1) at Saratoga, N.Y.
Judy the Beauty retired in 2015 after a 5th place finish in the Breeders’ Cup Filly and Mare Sprint at Keeneland. In 22 starts she won nine times and was in the money in 20 of those starts. Her influence as a broodmare will be interesting as her first foal in 2017 was a chestnut filly my Triple Crown winner American Pharoah. She is now in foal to champion sire Curlin. Basically ignored as a yearling, Judy the Beauty turned out to be more than a “beauty.” Her value today is reportedly in the $5 million range.